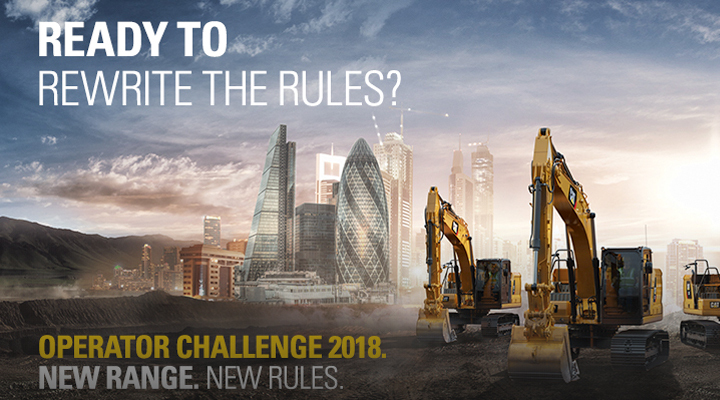 Finning UK & Ireland will host its ‘Operator Challenge’ event throughout April 2018. After a four-year hiatus, this year will be bigger and better than ever with the arrival of the brand new Next Generation Excavators. Operator Challenge is an international competition that encourages operators from across Europe to demonstrate their skills and prove their absolute accuracy and versatility. This year, it’s a game-changer. New Range. New Rules. Following Caterpillar’s 2017 launch of the new range of 20-ton hydraulic excavators, Finning will introduce the UK market to a new era of Cat machine. The 2018 Operator Challenge will grant customers the opportunity to get into the seat of, and experience the most advanced machine yet; putting their skills to the test in the new Cat® 320. With a total of eight events across the UK and Ireland, Finning is calling on Plant Operators to register for a chance to compete in this international competition. UK finalists will win a flight to the finals in Malaga in October 2018, with the crowned ‘Operator of the Year’ awarded a trip for two to the USA. At each event, Finning will also be showcasing its range of Ready2Go Compact Machines, along with providing more information and insight into Parts.Cat.com. Experts will also be on hand to discuss ‘connectivity’ in 2018, showcasing a range of technology and machine monitoring solutions that will enhance customer’s performance and productivity on site.